Here we have a selection of new Occult Charms for the Solar Exalted. As so often happens – at least in our games – none of them really have anything to do with combat. Fortunately, there are other things to do out there – and with some projects these can be quite helpful. Cost: 2 Committed Motes; Minimum: Occult 2, Essence 2; Type: Simple. Effect: When the user attunes himself to a demesne, he or she acts as an focus for it’s energies, almost as if he or she had become a living manse. Regardless of any separation, the user may sense both mundane and magical disturbances at the demesne and may consider themselves to be within the demesne whenever it’s convenient. It is possible to consider yourself to be within more than one demesne at a time this way, but the energy flows become increasingly difficult to balance if you do so; no single user may consider himself or herself to be within more than (Occult – 2) demesnes at a time. Unfortunately, this will not work on manses; their link with their Hearthstones preempts the use of this technique unless their Hearthstone is currently reforming. It’s worth noting that the currents of essence flow through the air and water as well as through the earth. While such currents are usually less stable than those of the earth, and thus demesnes of the seas and air are less common than those of the earth, they still occur. Of course, even in the first age, aquatic and (especially) aerial demesnes were usually left to gods and spirits. Cost: —; Minimum: Occult 3, Essence 2; Type: Permanent. Prerequisite Charms: Harness the Wild Dragon. Effect: Around manses, demesnes, and mundane locations – typically homes and birthplaces – to which the user is attuned, the user’s excess motes (those that the user would have gathered if his or her pools were not already full) are automatically expended on subtle guidance and regulation of geomantic essence flows. The user may apply this effect to up to (2 x Essence) locations at any one time. Fertility (Lunar): Infertility is vanishingly rare (unless inflicted magically), pregnancy is easy, and both birth defects and medical complications of childbirth (including death) are very, very, rare. Health (Wood). Everyone in the area gains +1 versus illness, infection, poisons, and bleeding. Most children will live to maturity. Longevity (Sidereal): Mortals and animals age at one two-thirds the normal speed. Prosperity (Earth). Everyone in the area gains +1 resources, up to a maximum of three. Even the street kids will be able to obtain enough to eat and drink, basic clothing, and liveable shelters. Security (Fire): The incidence of fires and other natural disasters is greatly decreased, as are the frequency of lesser accidents. Warding (Solar): Malevolent supernatural entities, including hostile ghosts, fair folk, and similar entities find their effective essence scores reduced by one within the area. Weather (Air): The weather is pleasant, the temperatures reasonable, and damaging storms very rare. Demesnes to which the user is so attuned no longer have any negative effects, either on attuned characters or on unattuned mortals. Positive benefits remain unaffected and a geomantic blessing applies within a radius of (Essence) miles. While such blessings commonly match the aspect of the demesne, this is not required. Manses to which the user is so attuned gain the Self-Stabilizing and Regeneration functions (from Lords of Creation). Any and all of their Hearthstones are upgraded by +1 dot and they are treated as being one level higher (it will be easiest to upgrade them using the Hearthstone Design Rules) as far as essence recovery goes. A geomantic blessing applies within a radius of (Essence/2) miles. While such blessings commonly match the aspect of the manse, this is not required. 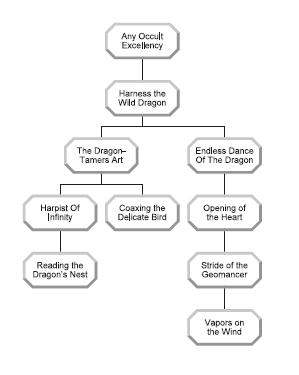 Effect: The master of the Dragon’s Dance has learned complete control over his or her personal essence bonds, and so enjoys a perfect defense against being forced to break them. The user cannot be forcibly unattuned from a manse, demesne, hearthstone, or artifact and cannot be forced to uncommit essence motes – although he or she may do so voluntarily or if subjected to unnatural mental influence which he or she fails to override which compels him or her to do so. Cost: Special; Minimum: Occult 4, Essence 3; Type: Permanent. 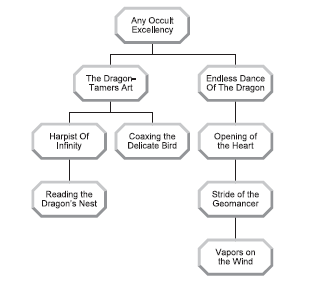 Prerequisite Charms: Endless Dance of the Dragon, All-Encompassing Sorcerers Sight (or similar). Effect: At the most fundamental level all things are patterns of essence, surging flows of energy. Solidity – like so many other things – is an illusion of limited perception. Once one has opened the gates or perception, and learned to control one’s personal essence flows, binding patterns together becomes a simple task – if one that represents a considerable strain. Opening of the Heart allows the user cause up to (Conviction +2) artifacts (and any socketed hearthstones in them) and/or unsocketed hearthstones to become immaterial and merge with his or her own essence. The initial strain of invoking such a merger costs six motes, three willpower, and three levels of aggravated damage. Once an artifact is so absorbed its basic attunement cost is doubled. Merged, unsocketed, hearthstones always provide their basic bonuses to more recovery but cost two motes each to attune so that the user can employ their special powers. Merged artifacts and hearthstones are engulfed by the user’s soul and exaltation, and cannot be damaged, disrupted, or have their effects on the user nullified, by any force which is not capable of doing the same to Exaltation itself. Objects which require external, physical, representations to employ – such as weapons – can be manifested at will, but the actual artifact remains bonded within the user; the manifestation is simply an essence-construct. If the user dies, shadowy copies of his hearthstones and artifacts remain merged with him in the underworld, and – unless he or she learns some similar charm again – become a permanent part of his or her ghost (if any). In this case the user’s ghost may commit essence motes to activate them as usual and – as a consequence of having nigh-indestructible items merged with his or her essence – cannot be forged into soulsteel or drawn into oblivion. If the user does not become a ghost after death, those same shadowy copies will remain attached to his or her higher soul, and will become a part of his or her next incarnation – although, as usual for underworld artifacts and hearthstones, they will only be effective in the underworld or in shadowlands. The original artifacts will remain linked with the user’s higher soul or – possibly – with his or her exaltation, and so will wind up in the custody of his or her next incarnation or with Lytek unless the user somehow makes other arrangements in advance. Effect: The cosmos of Exalted – from the Deep Wyld to Malfeas, and from Yu-Shan to the depths of the Labyrinth, is filled with flows of essence – sometimes twisted and tainted, but essence all the same. Characters with this charm have learned to purify and tap into those flows of power. The user gains a +2 motes per hour – a bonus which continues to function regardless of his or her location – and +5 motes of Personal Essence. As a side effect, his or her Hearthstones and other essence links will continue to function anywhere. Harpist of Infinity may be purchased up to (Occult) times, with cumulative effects. Cost: 12M; Minimum: Occult 5, Essence 3; Type: Simple / Permanent. Duration: One Hour / Permanent. Effect: Once a character has learned to attune himself to the lines of power, it becomes a simple matter sense disturbances within them – like a spider at the center of its web – and to allow his or her consciousness to ride along those lines, examining their status. Once a character has acquired this charm, he or she will automatically sense major essence-based disturbances within a radius of (2 x Per) miles, intermediate disturbances within (1 x Per) miles, and may sense minor disturbances with a perception check within a radius of (Ess x 100 yards). Major disturbances include the sabotage of a manse or demesne of rank 4+, fair folk armies on the march (with the wyld coming in their wake), the eruption of a shadowland, the casting of most dramatic solar circle spells, third-circle demons causing upheavals, major manifestations of the Incarnae, and similar events. Intermediate disturbances include the casting of the more subtle solar circle spells and the most dramatic celestial circle spells, rampaging second-circle demons, geomantic sabotage of a manse or demesne of rank 1-3, major gods making personal appearances, small armies of the fair folk, major exalted battles, swarms of ghosts erupting from the underworld, and similar events. Minor disturbances include awakening demesnes, the casting of more subtle celestial circle spells and the most dramatic terrestrial circle spells, intermediate exalted battles, and the summoning of first-circle demons. Disturbances below that threshold – subtle terrestrial circle spells, mortal thaumaturgy, a couple of ordinary exalts bashing it out, ordinary divine appearances, and similar activities, are simply too minor to notice amidst the magical background din of creation itself. Perhaps more importantly, by spending an hour in deep meditation tracing the flows of essence in an area, the user may compile a complete geomantic map of an area (3 x Per) miles across, locating demesnes, potential demesnes, and manses within that area. Cost: 8M, One Aggravated Wound; Minimum: Occult 5, Essence 4; Type: Simple. Effect: Once a character understands that nothing is truly solid – and can sense the constant flow of essence that makes up the foundations of the world – it is a simple (if arduous) matter to abandon the pretense of physical form and merge with those flows of essence for a few moments. Once mastered, the user may briefly dissolve his or her physical form, joining the flow of essence to emerge again moments later anywhere within the area that the user can currently perceive through Reading the Dragon’s Nest – that’s (2 x Per) miles if given time, (1 x Per) miles if in a rush, and (Ess x 100 yards) if in a combat situation. Cost: 12M, One Aggravated Wound; Minimum: Occult 5, Essence 5; Type: Simple. Prerequisite Charms: Stride of the Geomancer. Effect: Once a character has mastered the art of traveling along essence flows, it is a small step to learning to travel along the lesser essence links of Hearthstones and manses and other arcane links – such as those between a summoned demon and its summoner, or even the links created by mortal thaumaturgy. Using this charm the user can travel in an instant to anywhere to which he or she has an arcane link. Note that Hearthstones and Manses share an especially good one. Cost: 5M, 1W; Minimum: Occult 4, Essence 2; Type: Simple. Effect: The user has learned to delicately bend the otherwise firmly-anchored currents of essence running through manses and hearthstones. The user may meditate for an hour to attune to a manse without the consent – or the awareness – of others who are attuned to it, and may do so either at the manse itself or through it’s hearthstone. As a side effect, the user can activate up to (Temperance) hearthstones without the expenditure of motes or need for a socket, simply by carrying them on his or her person.